Monday is the Epiphany, the arrival of the Kings and the last of the Christmas festivities. For the occasion, the tradition in France is to choose a king by way of eating a crown-shaped-cake where a little figure (in older times a bean) has been hidden. Whoever has the symbol is the king for the day! Half of France eats a cake made of frangipane and half eats a brioche based one. Being from the South, I chose this year to go for the brioche version. 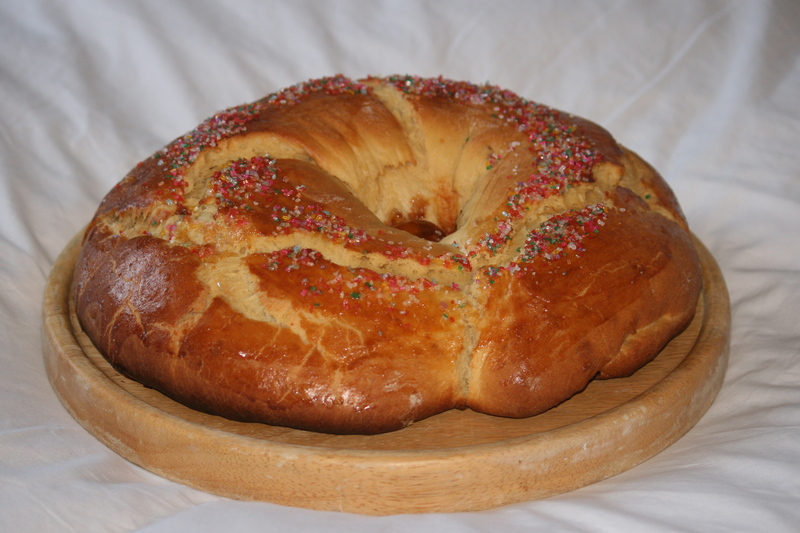 It is a moist brioche, filled with lemon peel, candied fruits and flavoured with orange blossom water. You can decorated it with more crystallised fruit or ground up sugar. This is so easy to do in the Thermomix, I can’t resist to give you the step by step here but you can always make it in a bowl if you like! Mix all the ingredients (but the egg yolk and candied fruit) in the Thermomix for 5 or 6 minutes on dough setting then empty the dough in a bowl and cover with cling film to raise for 1 hour. Once the dough has raised, punch it back into shape by kneading air out of it. 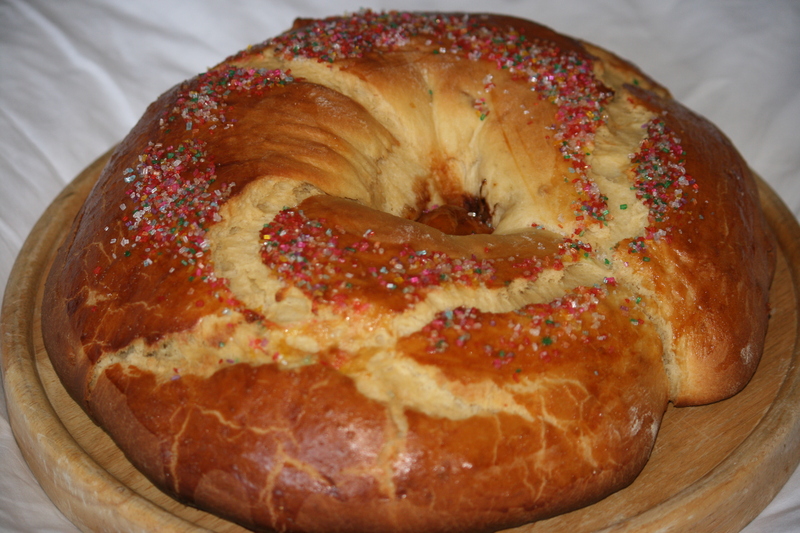 Mix the candied fruit into the dough and shape it into a crown. Use a silpat re-usable mat or a tray covered in oven proof paper. Decorate with crushed sugar and more fruit. Don’t forget to hide a “fève” or porcelaine figure in the cake and leave it to raise again for about one hour under a loose plastic bag – cling film would stick to the surface and ruin the look. When it is risen, brush the top with a little yolk, decorate and bake at 160° for 25 minutes on the middle rack of the oven. PS: I have to warn my readers it is pretty difficult to get good quality candied fruit in London, apart from lemon or orange peel and even that is hard to come by… I import mine from Provence where they produce the very best ones: Lilamand in Saint Remy de Provence or Maison Villaret in Nimes sell the “crème de la crème”: th variety is impressive, from apricots o chesnuts to wonderful melons. Though I have found good candied oranges or clementines in Italy too… A good excuse for a bit of shopping abroad. This entry was posted in family favourite, pot luck and tagged baking, brioche, butter, candied fruit, celebration, christmas, crown; Kings; Epiphany, Thermomix. Bookmark the permalink.